Renew your skin’s texture and clear pore congestion with The Ordinary AHA 30% + BHA 2% Peeling Solution, a 10-minute exfoliating facial for serious peel lovers. Combining the power of AHA and BHA exfoliating acids, this high-performance chemical peel targets dead skin cells, blocked pores and irregular texture to reveal a brighter and clearer complexion in just 10 minutes. Glycolic, lactic, tartaric, and citric acids exfoliate the surface of your skin, reducing the appearance of fine lines, blemishes and dullness, whilst salicylic acid extends deeper into the surface to clear pore congestion. In addition, Tasmanian pepperberry reduces any irritation that may arise from acid use, whilst vitamin B5 and black carrot infuse your skin with antioxidant protection. Apply to clean, dry skin a minimum of twice per week. Leave on no longer than 10 minutes and rinse with lukewarm water. If irritation occurs, remove immediately. The morning after, use SPF as AHAs can increase your skin’s sensitivity to sunlight. Free from alcohol, oil, silicone, nuts, gluten, soy, cruelty, fragrance, parabens, sulphates, mineral oil, methylchloroisothiazolinone, methylisothiazolinone, animal oils, benzalkonium chloride, coal tar dyes, formaldehyde, mercury, oxybenzon. Vegan. 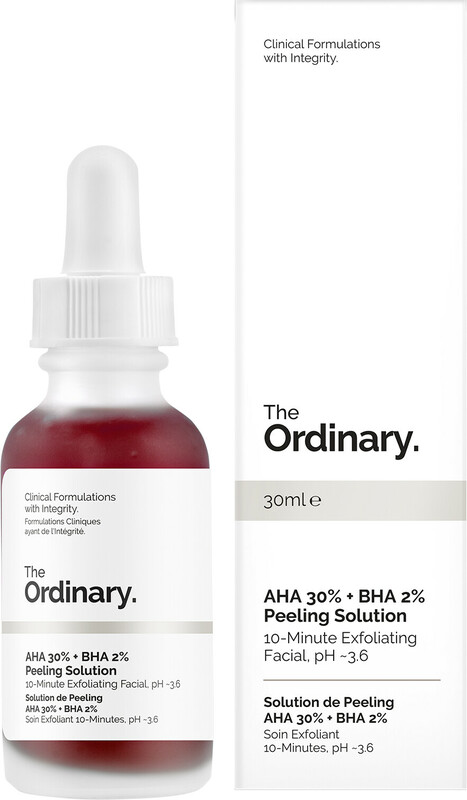 The Ordinary AHA 30% + BHA 2% Peeling Solution 30ml is rated 5.0 out of 5 by 2. Rated 5 out of 5 by Sue95 from Too three products in the ordinary I never use it as a peeling solution. Instead, I sometimes drop one to two drop into my moisture serum or cream. It does not irritate my sensitive skin and make my skin feel soft.